As one of the leading manufacturers and exporters of Chinese tea, China Tuhsu Yunnan Tea Import & Export Corporation greatly promoted the development of Pu-erh. 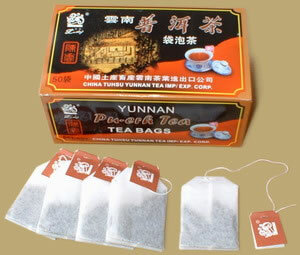 This traditional packed Pu-erh tea bags is one of the chief exports of the Corporation. It is a convenient way to enjoy Pu-erh Tea at home, at work or anywhere carrying large tea cakes might be difficult. PREPARATION: To prepare Pu-erh tea bags, place 1 bag in a cup, Cover with boiling water and let steep 3-5 minutes and serve. Pu-erh tea bags can be steeped multiple times.